In the swamp … they are not called ‘swamp diggers’ for nothing! Ron Horner has operated the Heking HK150SD amphibious excavator a number of times, but he hadn’t reckoned on doing a Titanic impression with a stray rock. A couple of weeks ago I had the opportunity to get involved with the making of a video on the safe operation of amphibious excavators in Australia. 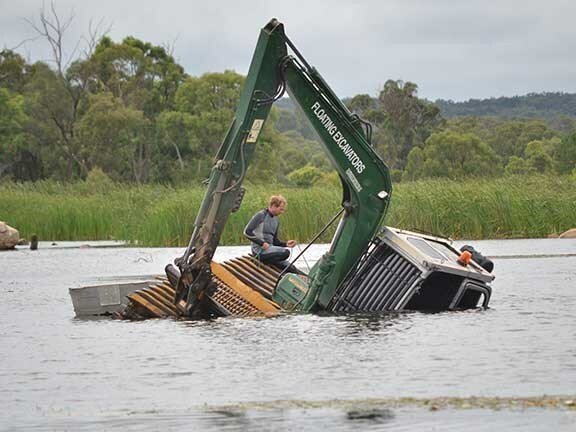 There didn’t seem to be any safety facilitators in Australia handling the subject, and, with the popularity of floating excavators on the rise, it seemed like a great idea. I know boats, so what could go wrong? During my time flipping around the country in semi-retirement mode and writing articles for Earthmovers and Excavators, I have made many contacts who I have called on at times to help out with machines and venues so we can bring some good, informative stories to our readers. 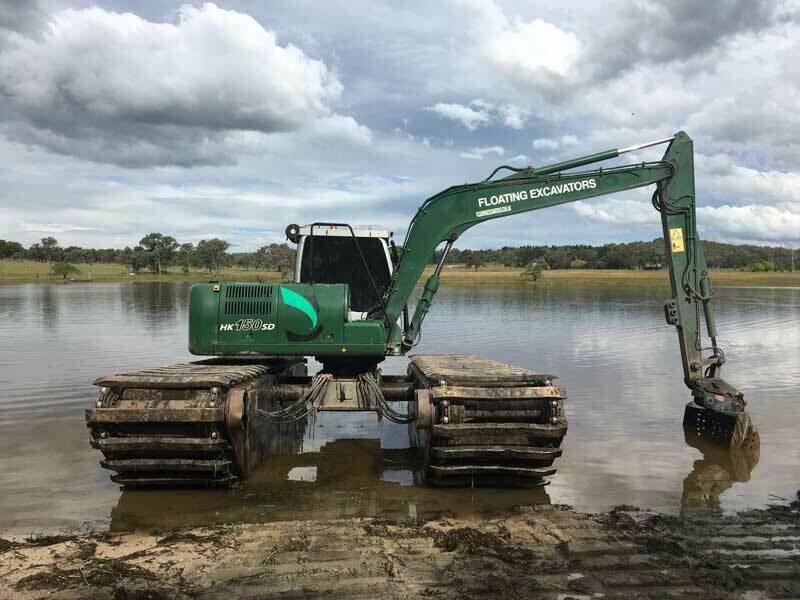 The basis for our safety video was Floating Excavators’ Heking HK150SD amphibious digger, which was over on the Granite Belt in south east Queensland. The site itself was perfect – located on a beautiful lake inside a Granite Belt winery with plenty of weed to remove and many good, elevated photographic points for videographer and photographer ‘Nurse Susie’ to get some shots. The first few days were filled with no surprises. Site survey was a priority as you always need to know the dangers which lurk under the water in most waterways, whether they are coastal canals, beaches, creeks, dams or lakes. Our plan to jump into filming immediately was thwarted by the need to clear the weed inundation close to the lake shore as it was impeding all of our shots. In all reality, we felt we only needed a day or two to get the video and audio completed for what we needed on this site, but the weather soon set in and for the next few days intermittent rain and squalls delayed our efforts. On the third day the weather report claimed it would improve, although it didn’t feel that way to me. I told the crew I would head out and tidy up the last of the weed we thought should be removed before filming commenced and that I would ring them when the site was ready. To my surprise, the rain had put about one metre of water into the lake and, as I put the big girl into the water and pointed her into a headwind and squall, I must say I did feel some trepidation. The lake is strewn with granite boulders that protrude from the shoreline and which I had been using as site locators to get my bearings. However, with the water in-flow of recent days obscuring many of them, I found myself just a touch disoriented. Travelling in 1.5m of water and into that headwind and sleet, I found it necessary to travel in high-speed mode to get some decent forward motion. 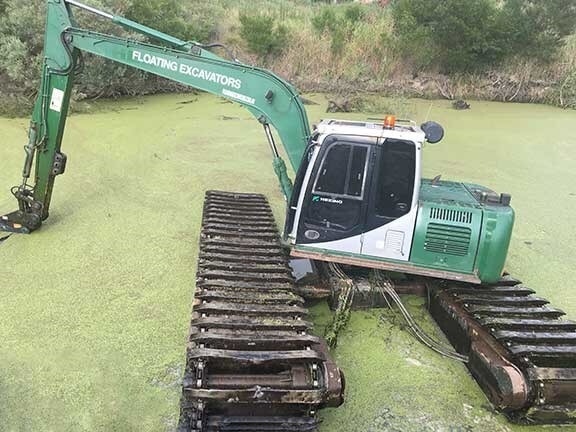 With this amphibious excavator, propulsion is only achievable by the speed and motion of the 1.2m x 150mm tapered and sealed box sections which form the track plates. There are about 80 of these hollow track plates which, along with two 6m x 1.7m steel pontoons extended to 5m wide, create the buoyancy for the machine. As the tracks are powered up, the propulsion is like that of the old paddle wheelers. It does take some getting moving, but directional changes and reversing are far more difficult and you can find yourself in trouble if you collide with a submerged object. 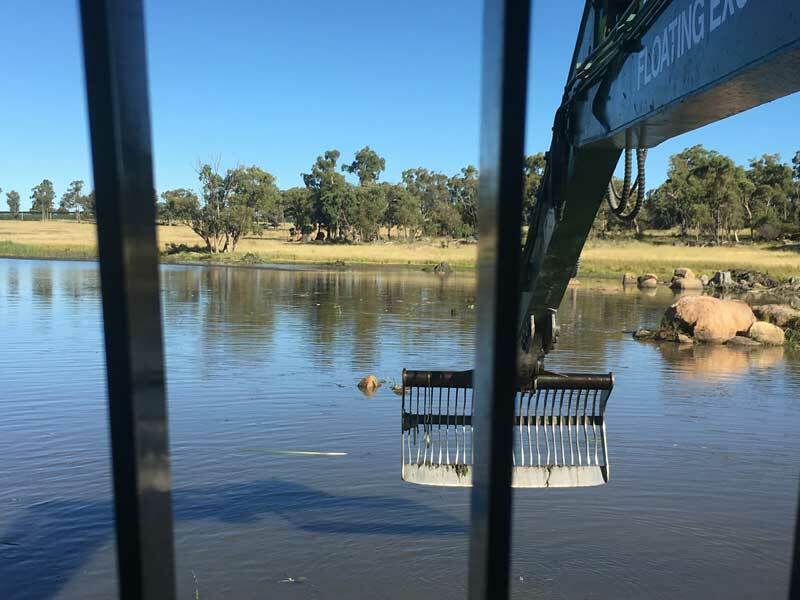 When working in water, it is imperative that the track frame is extended to its maximum width to allow for stability should you encounter deeper water; these machines can tip over quite easily if the operator is either not experienced or not focused. Floating excavators do have safety equipment on board in the form of an aqualung and breathing apparatus should the operator become trapped in an overturned vessel, a hi-vis inflatable floatation vest with whistle, and a hammer ‘to break glass’ in that WTF moment. When travelling under power and through water at or just close to optimum depth, the machine becomes more buoyant and therefore spins the tracks faster due to less resistance – after all, the machine is designed to operate in water, not rock. To safely achieve your goals it is important to have the machine in a perfectly balanced positon. With the Heking, this means the boom needs to be at full extension height with the dipper arm tucked close to the cab and the bucket used to balance up the machine. In saying this, the balance of the machine does tend to vary dependent on the amount of fuel you have in the rear-mounted 250-litre fuel tank and has to be assessed by the operator during the day. When in the operator’s seat and in the water, the tracks are just 100mm out of the water, so you don’t have a lot of freeboard to play with should something go wrong. I have demonstrated this particular machine on several sites and in numerous different conditions and, with my inherent fear of water and physical impairments restricting my ability to swim, I am one person who just doesn’t take adverse risks. Little did I realise that something was to go wrong on this day. In an instant there was an almighty crash, the machine was catapulted into the air, and I knew I was in immediate danger of sinking … and possibly drowning. Now I know the Navy and RAAF, and maybe some helicopter or aircraft agencies, practice underwater entrapment escapes but as a broken-down kangaroo shooter from Cobar I have never had training in this. My fear of water has driven me to have nightmares; when I know that the client has not completed water surveys for us when demonstrating any floating excavators, the adrenalin pumps for days. That said, there are procedures that I can train myself for. Try to not panic when the inevitable is about to occur, treat self-preservation as a priority, and try to cause as little damage as possible to the machine. With a $500,000 replacement cost, I know it’s my duty to at least try to comply with all of those things. On this occasion, the time it took for me to hit a submerged object with the cab-side track travelling a high speed and escaping from the upturned excavator was a mere five seconds. I can’t explain how quickly the mind and body acts when placed under extreme pressure and danger, but fortunately mine did. As the machine was catapulted skywards and over, I knew I was in extreme danger. During the rollover I had to kick the cabin door open, slew the machine 180 degrees to the low side and drive the cab into the water, protect the engine from water ingestion by keeping the air filter and exhaust out of the water for the split second the rollover took, place the dipper arm on the track frame to enable salvaging, and turn the engine off at the precise second before plunging my old and not agile body into the dark depths of the lake. There would be a couple of people who may have heard me yell profanities in my life during my weaker moments, and those that haven’t certainly would have had some curly hair if they were within close proximity that morning. At 7.30am, with no one around and with the sleety rain and wind blowing up the gully, all I could do was to ‘play pelican’ and sit it out on the upturned machine 100m from shore. It is at times like this that you have plenty of time to think "What if …?" and I remember the adrenaline pumping through my body big-time. I carry two iPhones every day in case one gets wet – one’s on board in its cradle and one’s in my pocket. I did get to pull the one out of the cradle but both phones were wet and buggered as I sat and contemplated my next step. Thank God for nurses, I say. The Heking looked a very sad sight and I felt very fortunate to get out safely as the owner of the winery and Nurse Susie pulled me out of the lake. "Retrieve or salvage?" was the question going through my mind, and that is the next part of the story.